Limassol / Munich -- Prestigio, a dynamic international vendor of state-of-the-art IT and CE products for style-conscious consumers, launches the new product family Prestigio MultiPad tablet PCs based on Android™. 6 weeks after the announcement and precisely within time schedule, the new Prestigio MultiPad family is there. The collection of Tablet PCs based on Android™ OS consists of three series: Prestigio MultiPad 3 series, 5 series and 7 series. 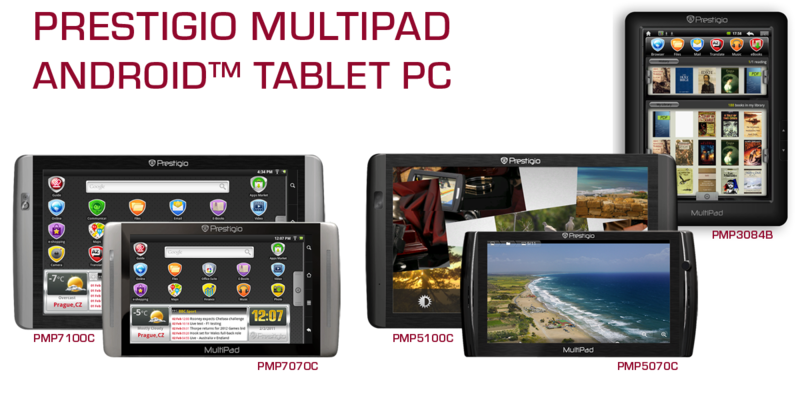 “Prestigio MultiPads represent an exciting extension of our very successful portfolio of mobile devices such as GeoVision GPS and Prestigio eBook Readers with which we already claim leading positions in many countries. Adding our mobile storage solutions with the typical Prestigio look and feel, now our brand offers a complete range of highly attractive and competitive products for modern mobile people who fancy a sophisticated lifestyle.”, says Yuri Antoshkin, COO of Prestigio. Therefore the Prestigio MultiPad family is dedicated to comfortable usability and true multimedia entertainment while offering uncompromised quality and affordability. Representing the design-focused understanding of lifestyle of Prestigio and excellent price performance ratio, the three series address a wide group of users. All products have certain features in common such as WIFI, 4way G-sensor, extra-long battery life and a typical Prestigio-style display design. An additional benefit to all devices is the light-weight and extra slim concept to grant comfortable mobility. The option to do office work on the go is of high importance to many users. Therefore, all MultiPads come with Office Suite Pro preinstalled, which is compatible to files from Microsoft Office 2003/2007 and 2010. The MultiPad 7 series features an unique “launcher concept” by Prestigio. This intuitive desk design concept makes the usage of the Prestigio MultiPad convenient and very easy. The entire “desktop” consists of 4 parts. On the upper half you will find various icons, which are grouped by the categories “LIFE”, “BUSINESS” and “ENTERTAINMENT”. With a simple click on one icon, a window opens below and gives direct access to all applications, which belong to this particular subject. E.g., a click on “Games” in the ENTERTAINMENT category will open a window with all installed games. Below the icons, there is a widget made by Prestigio, which features weather information of a location of your choice, RSS news feed and a clock with multiple functionality like alarm, stop watch etc. 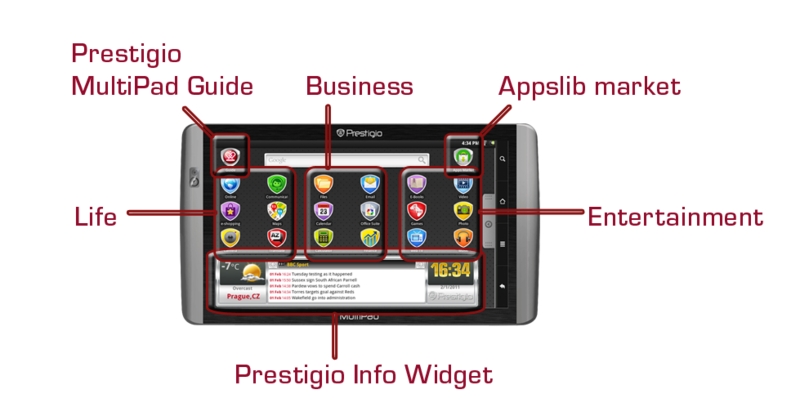 Moreover, in the top left and right corners the user will find direct links to a Prestigio MultiPad guide and to Appslib, the marketplace for more than 30,000 apps for Android™ devices. From the launcher screen you can open a “drawer”, where you will have direct access to all apps in an overview. The model PMP3084B is the entry level offering to beginners in mobile tablet computing. With a 8.4” high resolution display in an convenient 4:3 format, this model is not only an excellent eBook reader, but gives the user the whole world of audio-visual entertainment plus internet browsing via WIFI. The Prestigio MultiPad 5 series consists of a 7” and a 10.1” model, which offer a wider usability and connectivity to users, who already have an idea what kind of mobile solution they need in their daily life. This series has some great features like HD video playback, a USB2.0 host and many more – all packed in an attractive slim design housing. The top of the line of Prestigio MultiPad is represented by the 7 series. There are two models in 7” and 10.1”, and they are made for mobile enthusiasts that want it all: high-resolution multitouch touch screen, excellent connectivity via WIFI and Bluetooth. Mobile 3D gaming becomes very enjoyable thanks to the graphic accelerator. A wide selection of additional features make these models the best companions for leisure and work, regardless if at home or on the road. Especially for mobile people the PMP7070C and PMP7100C represent some of the lightest and slimmest (12mm!) Android™ Tablet PCs ever weighing in 300g and 480g only. 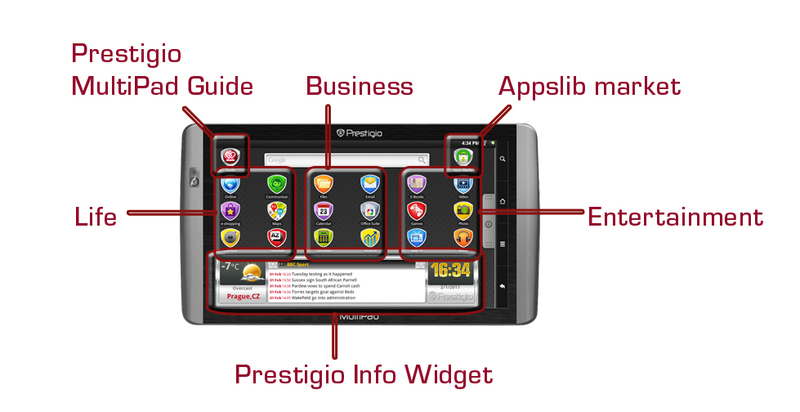 The Prestigio MultiPads come with a wide range of applications and multimedia content, either pre-installed or ready to download from AppsLib.com and Media.PrestigioPlaza.com. The entire range is available now. 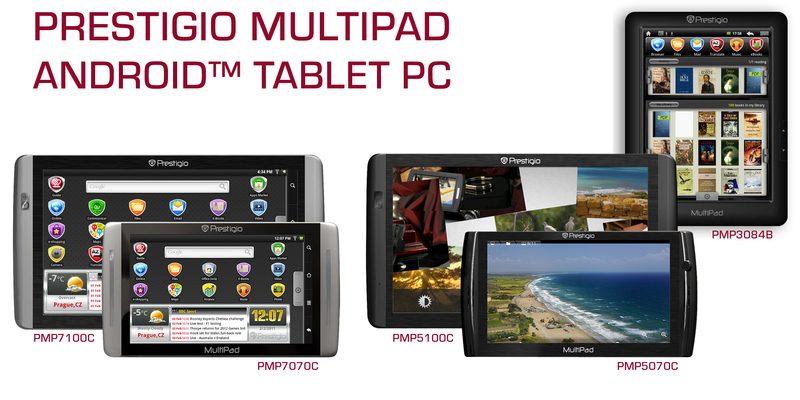 The recommended retail prices of Prestigio MultiPads range from EUR169 to EUR299 only. The Prestigio brand offers an exclusive combination of elegance, sophistication, high product quality, advanced technology and state-of-the-art design to more than 70 countries. Prestigio aims to provide an enhanced quality of life with affordable luxury products to those who enjoy a contemporary lifestyle. The portfolio encompasses various collections with GPS navigators, small form factor PC, mobile storage devices, eBook Readers, Apple accessories, and more. The brand is committed to providing innovative and reliable product to meet the growing demand for accessible, modern IT-related products and consumer electronics. Feel free to contact marketing@prestigio.com for any questions or visit www.prestigio.com. Master distributor of Prestigio products is ASBISc Enterprise Plc.